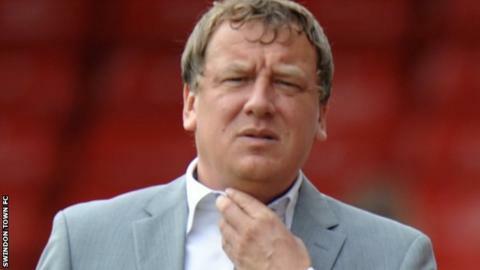 Chairman Lee Power has promised financial stability at Swindon Town following his takeover on Tuesday. The 41-year-old was brought in as a director in April by ex-chairman Jed McCrory, whose consortium bought the club from administration. Power invested £1.2m to help lift the Robins' transfer embargo and his company, Swinton 20 Reds, have moved to assume control. "The club is more sound financially than it's ever been," said Power. Swindon's financial problems came to light at the start of the year, after BBC Wiltshire revealed then-owner Andrew Black had put Town up for sale because he was no longer willing to invest. Went on to set up Cre8 Publishing in 2008 and also worked as a football agent. Power became chairman at Cambridge United in 2006 and made himself caretaker manager for 12 games. At the time, he considered putting the club into administration in order to wipe out £9m of unsecured debt. McCrory's Seeback 87 consortium took over in February, while the club were under a transfer embargo for overspending on wages and fees. The new board then slashed the playing budget in half - from £4m to around £2m - as part of their financial restructuring. "We've made considerable cuts to the budget, which has been well-documented," continued Power, to BBC Wiltshire. "We've got no debt at the moment and any money that is being haemorrhaged by the club, I'm personally putting in to cover. "The Football League have looked through our books and we have proof we can get through to the end of the season. "Instead of accumulating more debt, I'm injecting money to keep it debt free." McCrory appointed Power to the Swindon board but following Tuesday's change of ownership, McCrory opted to step down as chairman. Power admits the takeover caused friction between the two parties. "The option has been in place since April. It's always been our plan to exercise it and take control of the club," added the former Norwich striker. "The chairman [McCrory] was unhappy with some of the paperwork but that's all been cleared. Jed has stepped down and here I am. "We had a good working relationship but obviously there's been a bit of a disagreement but it's all done with now."